This meeting of the Lydia From Beetlejuice Fan Club will come to order! 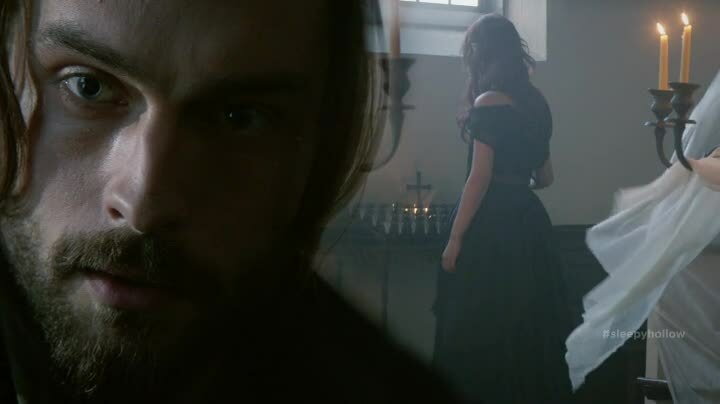 We find out more about Ichabod’s unknown child, Jeremy Crane. But just so you know, the answers were be slowly sprinkled throughout the episode, both in order to help build on suspense, but also because there is a secret sort of twist. And possibly more going on that the characters conclude at the finale of the episode, but I’ll cross that bridge when we reach it. 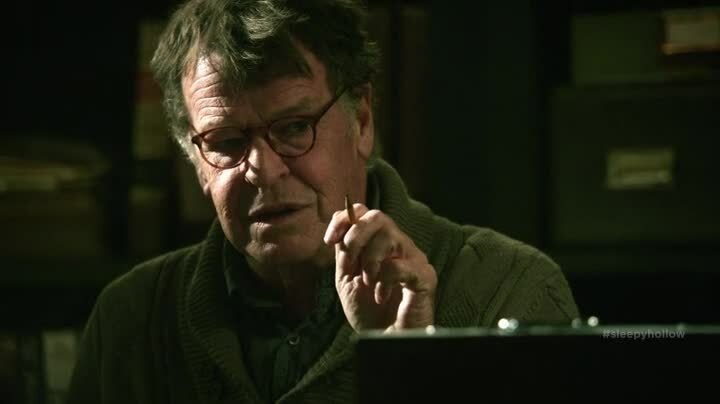 Sin Eater Henry Parrish (John Noble) returns, and he loves puzzles. He does crosswords all the time, because they help center him. Because of his powers, he lives an isolated life, so spending his time doing hobbies like that aren’t surprising. The puzzlework will come in handy, because the entire show is one huge puzzle of crazy awesome. It’s like those huge jumbo puzzle magazines I would get from PennyPress when I was younger and needed stuff to do on plane rides and bus rides. Crossword puzzles got so much easier when I just used nonsense Lord of the Rings words! Parrish and Crane share some moments of their fathers, Parrish mentioning that he never got to thank his father for what he gave him (his father now resides in a home, suffering from Alzheimer’s), while Crane laments never getting to be a father to his boy like his dad was to him. 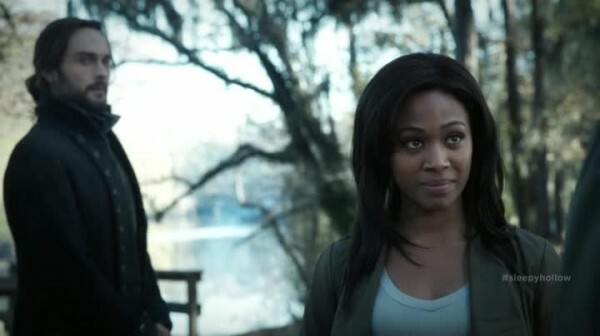 If there is one thing Sleepy Hollow does exceptionally well, it is to have well crafted moments between its characters while they’re discussion family relations. The return of Evil Mongo! Ichabod is chopping wood at his cabin. Abbie arrives with Christmas cheer, but Ichabod is in a cranky mood. 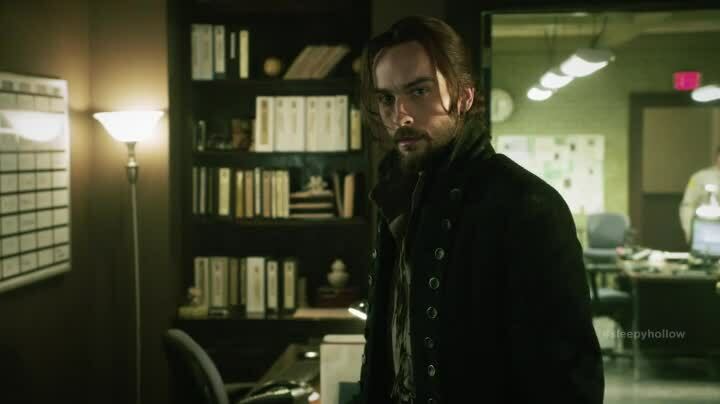 After a history lesson on Egg Grog of all things, we learn Ichabod has called in Sin Eater Henry Parrish (last seen eating Ichabod’s sins) to try to contact Katrina in Purgatory for answers about his son. Don’t touch him! No one touches Henry Parrish. Not because he’s crazy, but because of the whole sin eating thing. Henry Parrish has never done the contacting the dead thing, but knows enough that Ichabod needs to be close to death to make the transition easier, so it’s time for Henry Parrish to choke him! Hey, why can’t Ichabod just dream talk to Katrina like in the several other episodes? Because they explained that it was difficult for her, even though those episodes didn’t make it clear, and now it is too hard. It’s called a retcon! Now keep up, the episode is still going! Henry chokes him! He’s now in Purgatory, and it’s the return of the goth stuffed doll! Katrina is there, and Ichabod is all “Tell me about my son!” He’s named Jeremy (after Ichabod’s grandpa) and Katrina didn’t know she was pregnant when she put Ichabod to sleep. She explains she went to Europe and back to look for an unbinding spell, bu failed to find one. 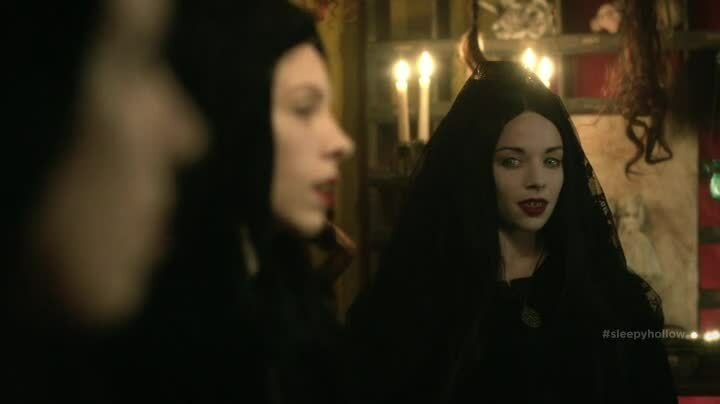 All the while, she was being stalked by members of her own coven – Sisterhood of the Radiant Heart, who were itching to find out where Ichabod was buried so they could kill him. 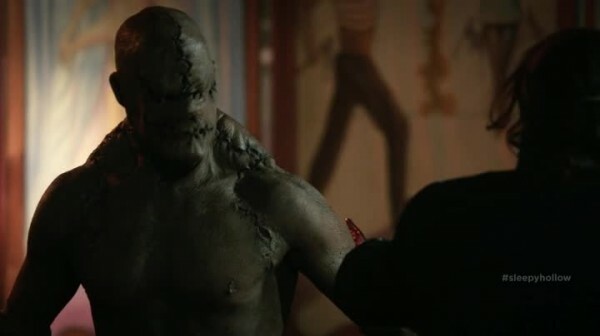 It’s not Moloch, he’s the new monster of the week, and he pops up out of the dirt near Ichabod’s cabin. Because we find out much later he’s a Golem, I’ll just call him that now. Notice I said Golem, and not Gollum. So NO Lord of the Rings jokes, okay? Okay. Ichabod and Abbie guilt Parrish to stick around for a bit to help find out more information about what happened to Jeremy Crane, going to a records archive at the library. Parrish is big on knowing the exact minutes trains are scheduled to depart. Captain Irving chats with the priest at the church he used to attend long ago, mentions the witnesses of Revelations (and finds out they’re destined to die as martyrs), and in passing mentions that his daughter Macey was hit by a car, which explains why she is in a wheelchair. Later in the episode he apologizes to ex-wife Cynthia for being a giant jerk all these years. It appears being destined to die maybe has changed his outlook on his life, and caused him to reflect on what he’s done wrong. From Cynthia’s response of how if he had said that a year ago, he would still be living at home, Irving comes off as the kind of guy who doesn’t apologize. That is consistent with how his character is played. 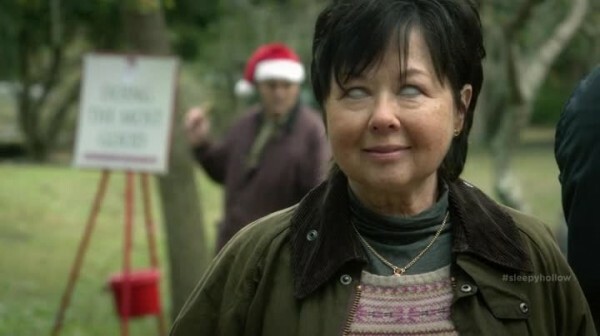 Irving takes Macey out to the park (in cuteness happenings, Macey calls her dad “Popski”) In non-cuteness happenings, Frank Irving totally gets threatened by a demon patterned after the villain from Fallen, as it switches bodies, the hosts unaware that they’ve been threatening Irving just seconds prior. And they’re threatening Macey’s soul, one of several soul threats this episode. Ichabod uses his book knowledge charm on the librarian, which both works and makes her very suspicious. So suspicious it’s a plot point in a few minutes. But first they dig up information about Jeremy. Instead of being like the kid from the Pearl Jam video, this Jeremy has pyrotechnic powers and fires would start when he cried. The fires eventually killed his caretakers Grace and Joseph, leading Jeremy to be sent to an orphanage, where his disappears from public records. Librarian Hudson….checks out! When her car is smashed by the Golem! Luckily, that gives them the excuse to go through the librarian’s things (official police business, don’t you know!) Imagine your surprise when you find out the dead librarian was a witch – like every other person in town! Specifically, she was a member of the Sisterhood of the Radiant Heart, and had a box with a diary in it of Ichabod’s son – a diary filled with pain that Henry Parrish can detect from across the room. Jeremy Crane was at one of them evil orphanages where kids get whipped all the time, especially weird kids who start fires. After a particularly brutal beating (brutal for network television standards), a drop of Jeremy’s blood gets on the creepy goth doll, turnning it into a golem monster that smashes the evil orphanage guy and is Jeremy’s new best bud. But unlike Calvin and Hobbes and their imagination adventures, Jeremy and Golem just seem to get into trouble and they are hunted down. I wasn’t clear on if Jeremy goes on killing sprees, or if the Golem is just out of control defensive and damages are accidental. But as the Golem is Jeremy’s only friend, and only connection to his missing family, he’s not about to give him up just because he may murder a few jerks. The Four Who Speak As One travel all over the country with a carnival, which coincidentally is in town right now! And the carnival is coincidentally empty when the heroes drive up, which saves money on extras! The Four Who Speak As One are basically four copies of The Tonnika Sisters, we even have one smoking a hookah (and smoke comes out of a different one!) The four finish each others sentences and have sharp teeth, but they also know when Ichabod shows up they are going to die. First they argue about fate and free will with Ichabod, and reveal they banished the Golem to Purgatory, and buried Jeremy and stopped his heart. Ichabod takes this as they murdered Jeremy. But we don’t see him die in the flashback, we just see him being buried and are told his heart was stopped. Maybe stopped because he’s frozen in time??? To show up in a few episodes down the line? That’s my theory. But because Ichabod thinks Jeremy is dead, he knows the Golem is protecting no one anymore. 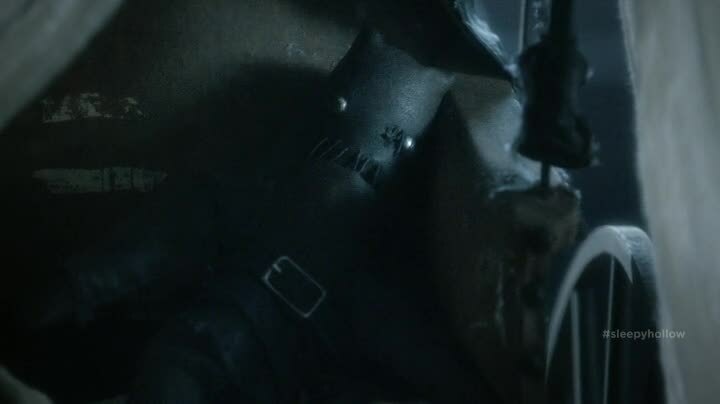 After the Four are smashed, Ichabod talks the Golem down, telling him he needs to let go. But his talk is really more for himself, to accept that his son is dead and gone. Golem goes nuts again. 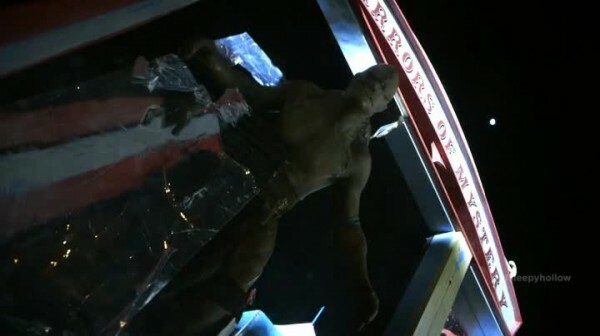 Ichabod stops during the Golem rampage (as an aside, the previously deserted carnival now has extras running around screaming their heads off) to stare at some funhouse mirrors. Because the mirrors are smashed and a shard shaped life a knife stabs him, getting his blood on it. And only blood of a Crane can turn that Golem off. So the Golem is stabbed, it turns back into the creepy goth doll, and the day is saved. Except for whoever has to explain the five dead bodies in Sleepy Hollow. Ichabod’s gift from Abbie of an embroidered Christmas stocking (which he does not understand) is interrupted by a visit of our favorite blurry demon guy from Legend, Moloch! Moloch declares he’s coming for Abbie’s soul, that Ichabod will deliver it, and that there’s nothing they can do, so nyeh nyeh nyeh! Clues for the season finale, no doubt! Looks like Abbie will have to “die” to save someone, but what exactly will go one? It will be a mystery until January. Until then stay Sleepy! 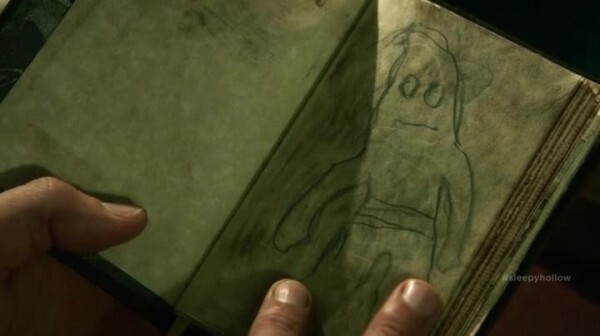 For more information about golems, consult Psalms 139:16 and your local library. Assuming a golem hasn’t killed your local librarian. I am the new Dr. Who. In Purgatory, the only thing to do is light candles all day. 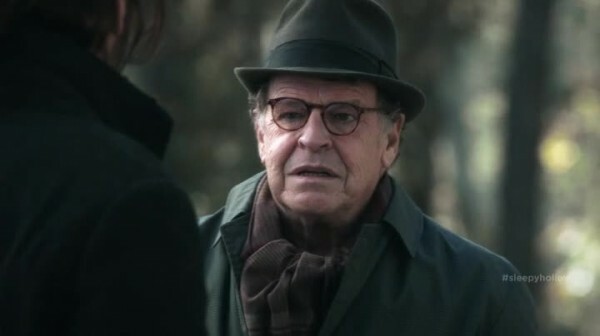 Look John Noble, we paid for you to appear in the WHOLE episode! 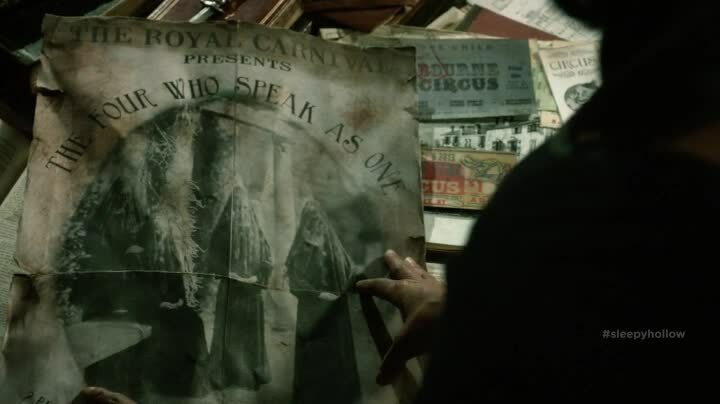 Remember: Everyone in the circus is in a witch coven. Even the lion tamer. Especially the lion tamer! Under that mask? Daniel Radcliffe! Now that I had a son for one episode, it’s time to forget about him until several episodes later!